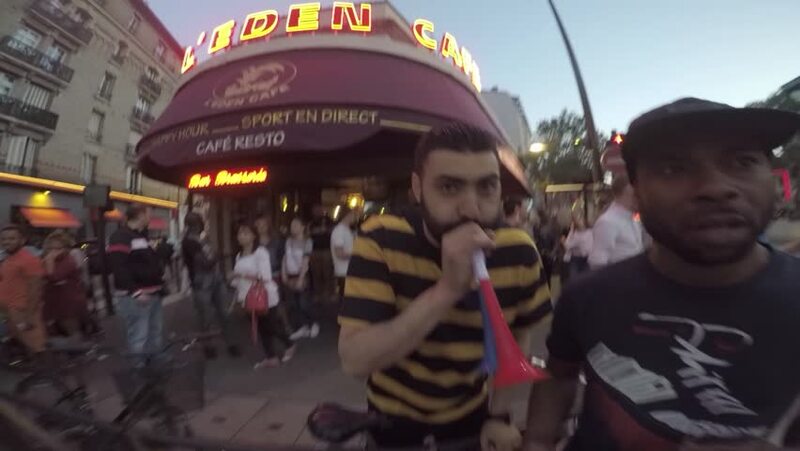 PARIS, FRANCE - JULY 15, 2018: French football fans celebrate France's team victory of 2018 FIFA World Cup. Guy blowing into the pipe and yelling at the camera. Sound on. hd00:22MANCHESTER, ENGLAND, UK - FEBRUARY, 2017: pop rock band of four performing live on the pedestrian shopping Market Street in Manchester city centre center, rear view, low angle. hd00:29SINGAPORE - JANUARY 26, 2015: People relax on the waterfront of Singapore river in the evening. Quay Singapore River is a very popular place with tourists and locals alike. 4k00:14JERUSALEM, ISRAEL - APRIL 17: Tourists visit bazaar market street old city Jerusalem buying souvenirs and exotic food in colorful alley, April 17 2014. Minimally processed Apple ProRes 422 (HQ). 4k00:27LONDON, UK - OCTOBER 8, 2011: People and traffic in slow motion. 4k00:06New York City, May 2017. People walking and hiding under umbrellas during heavy rain.